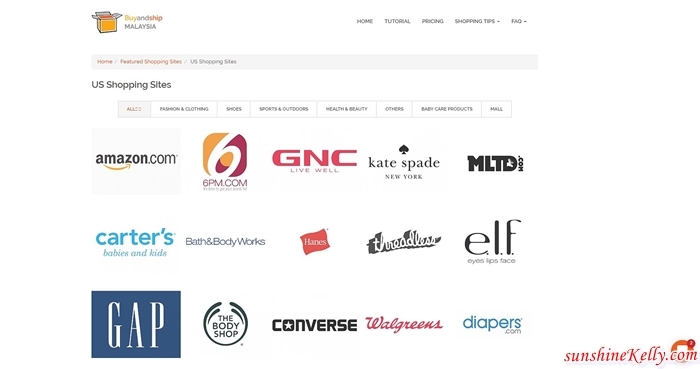 What is BuyandShip? Well, BuyandShip is an international online shopping transfer service. Established in 2014, the HK-based company providing global shipping services for online shoppers like us who wishes to shop across US, UK, Japan, Korea, Hong Kong and China with ease, comfort and yes it's affordable. 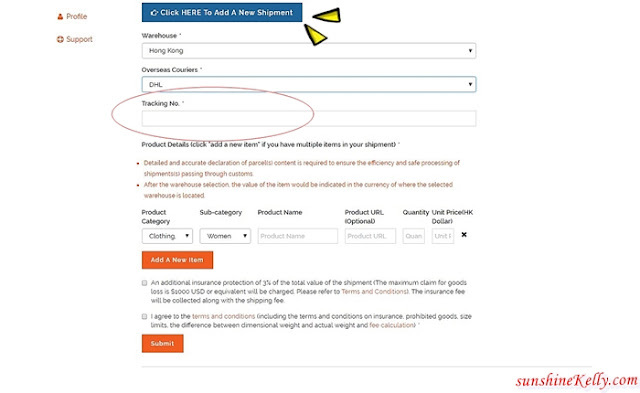 BuyandShip have established a network of self-operating (US, JP) and dedicated (KR, CN) warehouses for users to ensure fast and efficient delivery services. 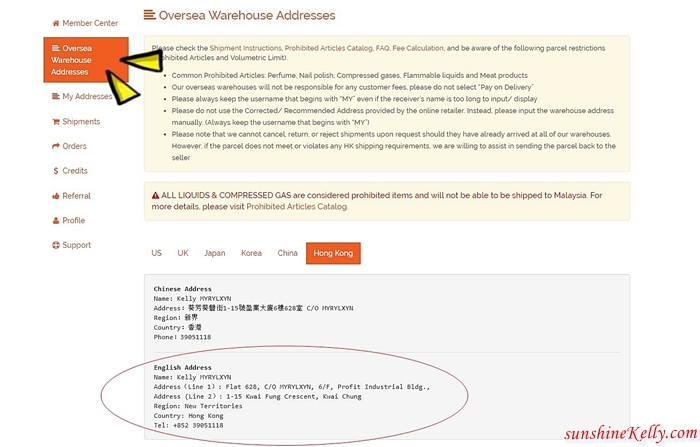 Scheduled flights from these warehouses back to Hong Kong are arranged on a weekly basis, while the delivery fee will be based on the parcel’s actual weight (not parcel size). 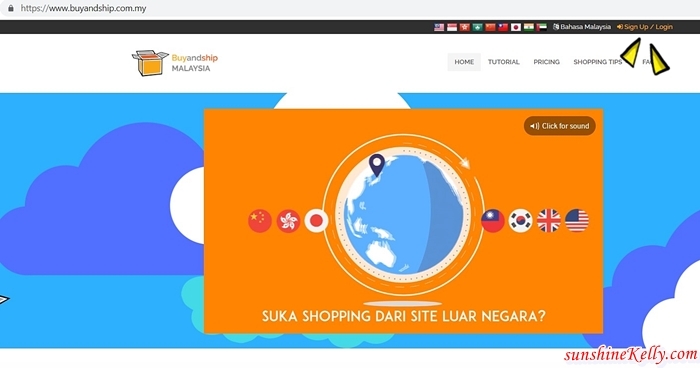 Pssttt… do you know that BuyandShip is offering RM15 only for every pound of your shipment from US, UK, Japan, Korea, Hong Kong, or China. And the delivery days is between 4 to 7 days for shipment from Japan, Korea, Hong Kong or China and 6 to 9 days for shipment from US and UK. Besides their good shipping rates, another plus point is that I can purchase products from multiple global online stores like from US, Japan and more, condolidate them in Hong Kong warehouse and lastly have them conveniently delivered in one parcel to my doorstep in Kuala Lumpur. Let's get started! First head over to their website and sign-up HERE. 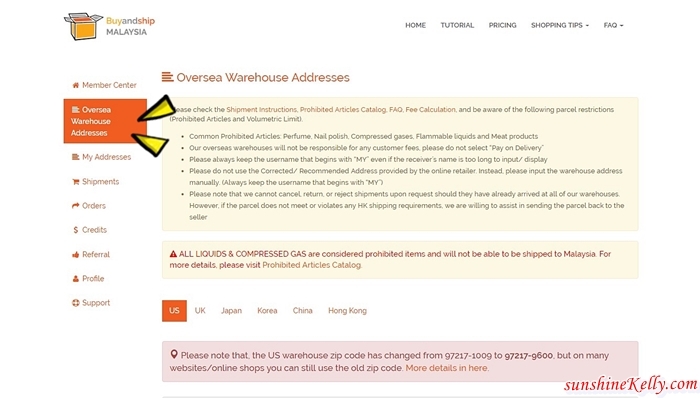 Upon registration, you can access their overseas warehouse address and your membership ID. Yay! 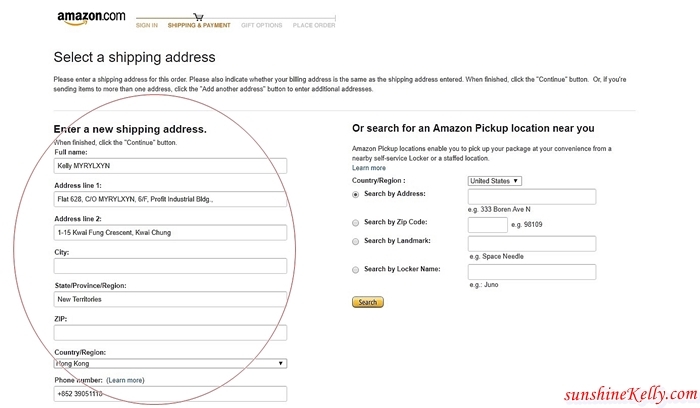 and now you can start shopping at international online stores across US, UK, Japan, Korea or China. Head over to the 'Shopping Tips' on the top right corner and click on the country that you wish to shop at or you can always check their latest discounts and news first. Once you received the Tracking Number and shipping courier details by your online retailer, you have to quickly Declare Your Package on BuyandShip website here the “Click here to add a new shipment” through our membership centerIs very easy just key in the necessary information like, warehouse is Hong Kong and via what courier, tracking number, product information and once you have completed, just click submit. Kindly take note that the shipment will be delivered to BuyandShip Hong Kong warehouse before it will be delivered to Malaysia as instructed. 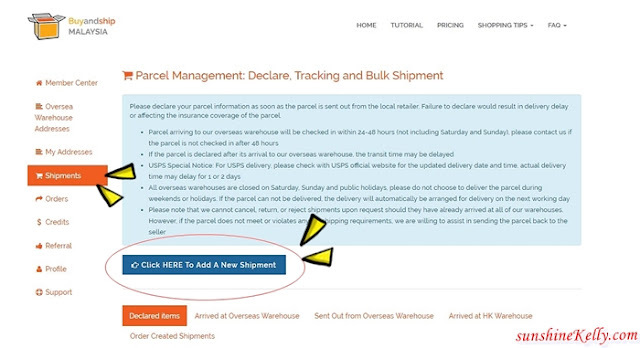 When the package has arrived at their Hong Kong warehouse, you will receive an email directly from BuyandShip. Delivery fee will be calculated based on the sum of the chargeable weight. 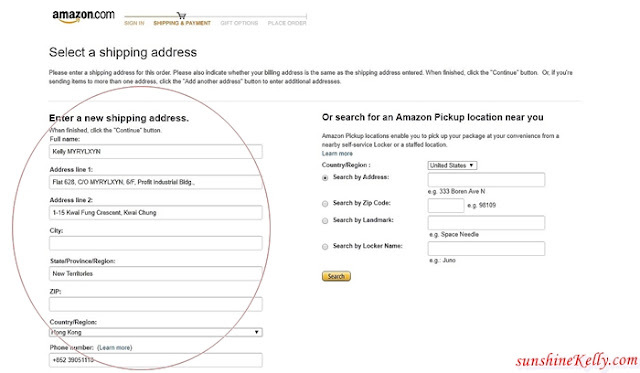 When you are ready to receive your parcels, you can merge the packages into one and add your address in Malaysia. 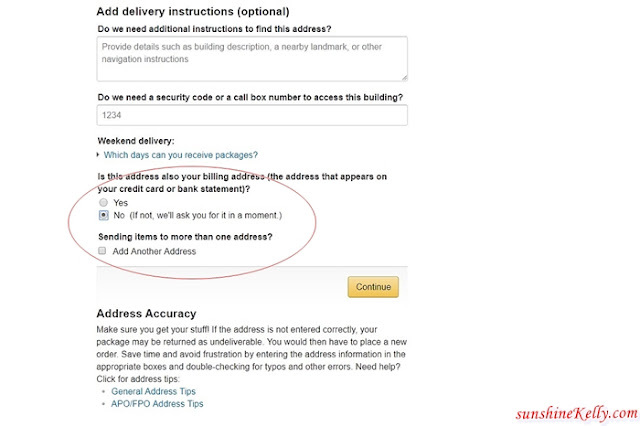 When consolidating multiple packages into one, the parcel may be repackaged with no extra charges. Choose to pay by Buyandship Points or Credit Card Payment. Delivery fee needs to be paid before the package leaves our Hong Kong warehouse, otherwise the package will not be sent to Malaysia. So now sit back and relax, the parcel will be send directly to your doorstep! Expected time of delivery to HK warehouse: US & UK within 4-6 days / Japan, Korea, China within 2-4 days. BuyandShip will send out your package within 1 to 2 days upon receipt of your “Consolidated Shipping” request and payment. Home Delivery to your address takes about 2-4 working days, but in case of customs inspection the time of delivery may be delayed. 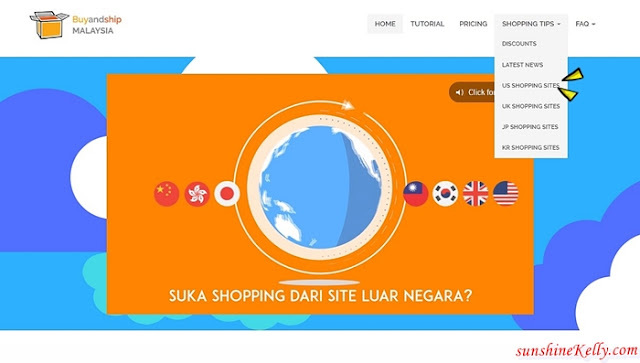 From now on, overseas online shopping can be fulfilled with just a click of a button. All you need to do is sit back, relax, and your parcel will arrive at your doorstep in no time. In case you are unsure about the steps, you can also refer to their Tutorial on the top right corner. So now I don’t have to stop myself to shop at international online stores anymore, even though some stores may not provide international shipping or their international shipping fee is way too high because I have BuyandShip! We don’t have to worry about our shipping cost. The more we save the more we can spend on things that matters, right? Earn Buyandship points and save on shipping costs! Wow this is way too easy to shop from overdea merchant. Can be dangerous too like this lol. Shop till drop hahaha. Hehehe... at least you get to save on the postage fees. Oh yeah, i want it too. Always heard about this but ai never tried. So i guess this is not a scam. Maybe i can try it in future.